A fantastic 'novel' gift for any bookworm you may know, or for putting into your pre-packed maternity bag. 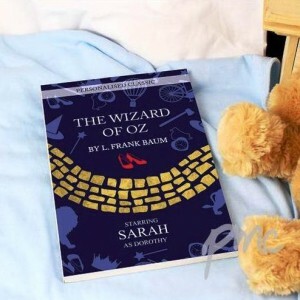 This personalised classic features the character Dorothy which can be personalised with up to 12 characters in length (please note this is a gender specific role). You can also add a personal message up to 50 characters inside the book to make it extra special. Ideal for Maternity Bags, Mothers Day, Birthdays, Valentines, Christmas.